THIS IS A REPRODUCTION PROJECT MADE BY @caius ALL INFORMATION HAS BEEN POSTED WITH HIS PERMISION. CREDIT AND MERIT GOES TO HIM. See you all to next reproduction project! 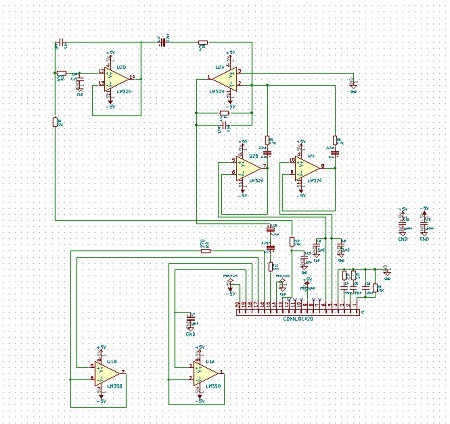 I've done something similar to a Neo Geo MV1FZ which completely lacked the stereo audio output which other boards had: I've downloaded the schematics of the stereo boards and reproduced the stereo mixing-amp part on a breadboard and attached it to my MV1FZ. @donluca what are you waiting for?? Please post about it! I've always wanted to start a thread on how to get stereo sound out from several arcade boards. All the ones I own have a stere jack added because, contrary to popular belief, many are actually capable of stereo sound and, most importantly, make full use of it. But I need time to do a proper write up, with pics and everything, instead of writing a half-assed thread with vague information. This week is going to be hell, but I promise I'll write something down when I have a bit of time to sit down and write everything. What are the symptoms that indicate a need to replace the HB-41? I've got a Raiden DX board (I'm assuming it's using the HB-41 as well?) that after about 15 mins of play, the audio random screeches noise for a couple seconds at a time. Would this be an indication that the HB-41 is going bad? No, Raiden 2/DX use the 'HB-45A' which has same SIL package and functions of HB-41 (it mixes/filters music and sound FXs) but different pinout.It's on my TO-DO list.Anyway your issue should be caused by the HB-45A, probably the internal OP-AMPs are faulty. The post was edited 1 time, last by caius ( Feb 3rd 2018, 8:48am ). Awesome info, Caius. I'll keep paying attention to your project updates and see how you get along with the HB-45. My DX board is one of my prized games. Not that it's exactly super rare or expensive, but mainly because I bought the board off ebay, cheap, with faulty sprite graphics and worked it out that one of the custom IC's needed to be re-flowed. It was the first board I ever repaired and was pretty proud of that moment I powered it up and it worked! I'm never getting rid of it, and hope to keep it in healthy condition for as long as I can (barring the audio issue). Update.I decapped the 'HB-45A' (it's very similar to the 'HB-41'), figured out schematics and routed them to a PCB layout, I attach a 3D simulation.Now I'll send it to manufacturer. The post was edited 1 time, last by caius ( Feb 3rd 2018, 11:47am ). Looking forward to clean sound on my Raiden DX. 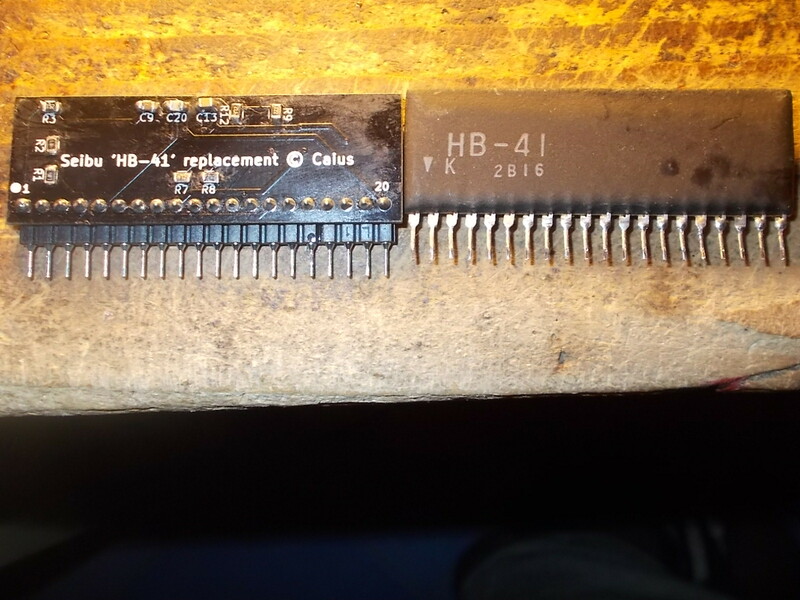 Some update.I received the 'HB-45A' bare PCBs from manufacturer and assembled a unit.Now I'm looking for someone that can test it on a Raiden II/DX PCB (or other board that use the hybrid). Well I got this Toki board yesterday for 100$ ... and of course there are no sounds what so ever, and playing with the pots doesn't do much either. Should I try replacing the yamaha YM3812 or should I simply directly get this hb-41 repro? First of all you should figure out if the lack of audio has a digital or analog cause.In first case the system ruled by the Z80 CPU is not running properly.In latter case the problem is due to a bad HB-41 or LA4460 amplifier.In order to determine the nature of the fault you could use an audio probe and 'listen' to various point of the audio circuit like analog outputs of YM3014 DAC or OKI MSM6295.If you don't hear anything then the fault is in the digital section of audio circuit.If you hear music or sound FXs, the fault is in the HB-41 or amplifier.Obviously you can use also a logic probe to troubleshoot the Z80 system. 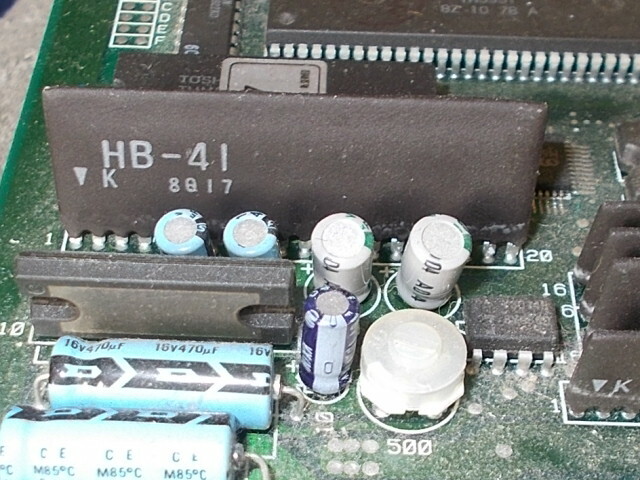 Check if -5V is present on your JAMMA harness. The post was edited 2 times, last by caius ( Mar 2nd 2019, 9:02pm ). Caius: thank YOU! there is no -5 v in that cab! there is on one of my other cab and guess what?! sound is fine ! now I'll look into that -5v on that cab cause there's no sound in magician lord on the neo multi and I'm guessing that's why ! thanks also for teaching us how to fish even if you have the fish for sale! much appreciated! I did and no change. Yet it works in the NAC cab. Please post your issue here Games with Issues in order to avoid going offtopic. @caius I have a Legionnaire board that has very very low sound. All sound seems to work (music and effects) and the pot for the volume works, but I have to turn it up to full volume and also turn my speakers very high up to hear anything. At that high of a level I also here power hum and of course, I don't want to keep it up on high volumes to play. 1. Is it possible it is the HB-41? James from JNX has done a cap kit on the main PCB with no effect. (Caius answered with yes this is probably the issue). 2. Since my sound is still working (just very low) is there one component I can replace on the actual HB-41, or will I have to replace the entire thing? If for example low sound symptom is just one thing that is failing, versus no sound and the whole HB-41 is bad. 3. I prefer to keep it stock and save money where possible, but I have 3-5 of your other reproductions, and they are TOP NOTCH so I am not worried about it if I do need to buy one from you! I asked @Mitsurugi-w since he does the amazing work with the Konami sound modules, but he said no on this one. Thanks for what you do for the community and keep up the good work!